A marine canvas cover for your boat helps protect it during the winter months against snow and rain, and in the summer months against the rays of the sun. A top-quality custom marine canvas shop specializes in custom design, fabrication and installation of all types of boat canvas covers, including mooring covers, bimini tops, T-tops, cockpit covers, helm covers, fender covers, and other marine canvas covers of all types. They also custom design, fabricate and install dodgers, glass (isinglass) cockpit enclosures, and screen enclosures, and make boat covers of all types for powerboats and sailboats, for every size boat from dinghy to yacht. In addition, custom canvas shops perform sailboat sail repairs, interior and exterior upholstery, framebending for bimini tops and more, using all stainless steel fittings, Sunbrella canvas, and other top-quality materials. When you need a boat cover, sail cover, custom bimini top, outboard engine cover, or any other type of marine canvas for your boat, a custom marine canvas fabricator is your source for quality workmanship and materials. Custom-designed marine canvas covers will provide you with years of protection for your powerboat or sailboat and its fittings. When custom canvas covers, enclosures, and biminis and custom-fabricated to fit your boat, the marine canvas fabricator will require access to the boat itself in almost all cases to ensure a proper fit. 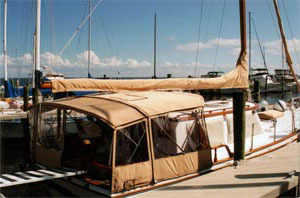 A reliable custom canvas shop will have experience with all type of marine canvas covers, enclosures and upholstery.